Pristine scenery and relaxation await when you stay at this 3-bedroom, 2.5-bathroom vacation rental house in Indianola! Situated right on the water, this modern home boasts 3,500 square feet and comfortably sleeps up to 6 guests. 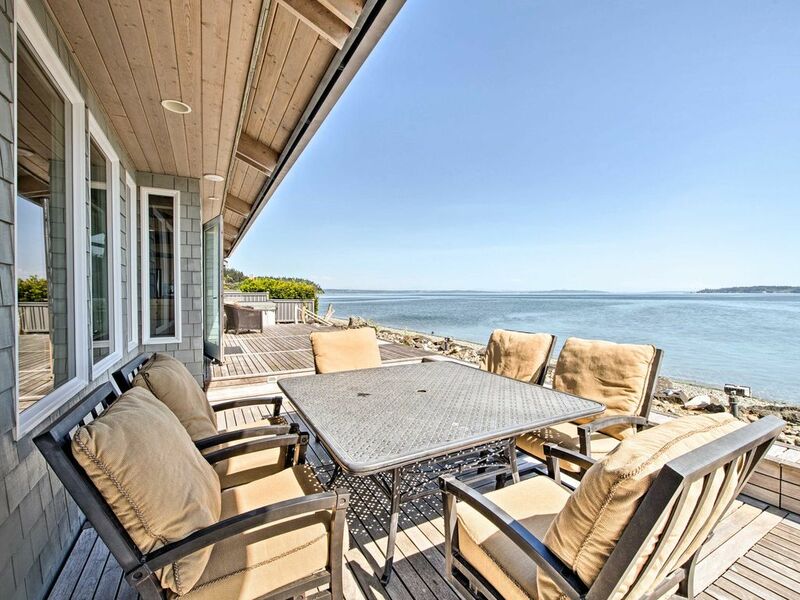 You'll love the chic decor, plush furnishings, and views of Mount Rainier from the spacious deck! Walk the beach looking for scallops and sand dollars or take the ferry to downtown Seattle and explore the wonderful city. Natural light fills the interior of this beachfront home, illuminating the plush furnishings and modern design! Unwind on the sofa in the living room and look out at the pristine views through the wall of windows. Glance through the telescope to get a closer look at Mount Rainier in the distance! You'll be itching to step outside to the expansive deck and soak up the fresh air and sunshine from the comfort of the outdoor furniture. Walk down the steps and take a relaxing stroll along the beach looking for scallops, sand dollars, and more. When it's time to eat, make your way into the fully equipped kitchen to create culinary magic for the whole group. Stainless steel appliances and ample counter space highlight the kitchen while the myriad of windows makes you feel like you're cooking outside. Snack on appetizers at the 3-person breakfast bar until it's time to set the dinner table for 10. After the plates have been cleared, gather in the family room to watch a movie on the flat-screen Smart cable TV. Cap off the day around the fire pit sharing stories and laughter under a blanket of stars! As eyes begin to tire, retreat to the well-appointed bedrooms to rest your head for the next day's activities. The spacious master bedroom features a soft queen-sized bed, a flat-screen Smart cable TV, and en-suite bathroom. Try your luck at the blackjack tables or slot machines at The Point Casino & Hotel, just 15 minutes from the home. For more gambling and entertainment, drive 15 minutes to the Suquamish Clearwater Casino Resort which offers a variety of games, restaurants, and a golf course. Stay closer to home with a round of golf at White Horse Golf Club, 5 miles away. When you don't feel like cooking at home, check out some of the delicious restaurants in the city of Kingston like J'aime les Crepes Creperie, Westside Pizza, and The Kingston Ale House. Take the ferry across Puget Sound to the town of Edmonds where you can take a boat trip through Puget Sound Express Whale Watching. Museums, parks, boutique shops, and tasty eateries await when you journey 30 minutes south to Bainbridge Island. For even more sightseeing, take the ferry across to downtown Seattle to see the Space Needle or stroll through Pike Place Market. Beautiful home. Great view and well appointed. Our family stayed here in December 2018. The home was very cozy and the kitchen was well stocked, but the most wonderful part are the views of Puget Sound and Mount Rainier! We're looking forward to our next visit! Beautiful house on the Port Madison shore. The big kitchen includes spices and coffee. Paper towels and toilet paper were included. The barbecue grill is high quality and worked well. The hot tub was not working, but we had not brought swim suits anyway. The manager responded quickly to our questions. At low tide, we found sand dollars, sea shells and dug clams. Between sight seeing trips, we spent days just watching Canadian geese, sailboats, cruise ships, fishermen, reading and talking on the porch. On a very clear day, we could see Mount Ranier. The neighborhood is gorgeous, quiet and friendly. During the week we rode ferries, attended a Mariners game, played golf, toured Chihuly Gardens and the Seattle Art Museum, all of which were outstanding. Most of our dining out was on Bainbridge Island - Doc's Marina Grill, Harbour Public House, J'Aime les Crepes, Isla Bonita - all very good restaurants. It was the best vacation this three couples have had, so we highly recommend this property. We absolutely LOVED this beautiful, spacious, and comfortable home. The house and amenities surpassed our expectations.The views are amazing!! The host was immediately available and very helpful. I highly recommend this property if you want a relaxing and peaceful vacation. It is a beautiful property, quiet with amazing views. Very comfortable beds, amazing kitchen and the owner was easily reachable and extremely helpful.